Tommy Fleetwood is among the favorites to win the PGA Championship this week. 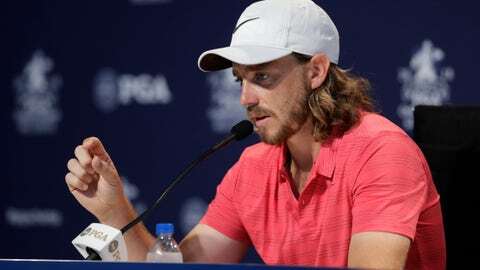 ST. LOUIS — Tommy Fleetwood has been playing so well lately that he navigated Club de Golf Chapultepec just outside of Mexico City with a mere 12 clubs, two fewer than players are allowed in the bag. Finished in the top 20, too. So when the hosels on a couple of irons bent from wear and tear at the WGC-Mexico Championship, there was no Nike trailer waiting to fix them. Shipping them out was out of the question, too. He just played without them. He’s been getting along just fine for a couple of years now, slowly climbing the world ranking to his current perch just outside the top 10. He won twice on the European Tour last year and captured the Abu Dhabi HSBC Championship in January to keep the hot streak going. The next step is winning on the PGA Tour. Or winning a major championship. He could do both at Bellerive. Fleetwood is among the favorites to win the PGA Championship this week, a reflection of the way he has performed since missing the cut at The Players Championship. He shot a blistering final-round 63 to finish second at the U.S. Open, used a second-round 65 to finish tied for 12th at the British Open and strung together three rounds in the 60s for a top-10 result at the Canadian Open. Last weekend, he opened with 66-63 at the WGC-Bridgestone Invitational to take the second-round lead, only to fade with a pair of rounds in the 70s to finish well back of winner Justin Thomas. The PGA Championship has a habit of crowning winners who are relatively new to the scene. Jeff Sluman won for the first time at Oak Tree in 1988. John Daly turned the trick three years later, when he won at Crooked Stick as the ninth and final alternate. Sean Micheel’s only PGA Tour win remains his victory at Oak Hill in 2003, and Martin Kaymer turned European Tour success into his first win in the United States when he triumphed at Whistling Straits in 2010. Fleetwood doesn’t seem to have much trouble with that. He’s one of the most easygoing players you’ll find, the kind of everyman with a quick smile and equally quick wit that’s so endearing to fans. Need proof? The protective case on his cellphone was covered by a grinning picture of Thomas Bjorn, the European captain for next month’s Ryder Cup. Not that Fleetwood needs to butter Bjorn up. He’s a near-lock to make the team. Especially if he finds himself in contention at another major championship come Sunday.